Will the Super Bowl return to North Texas? 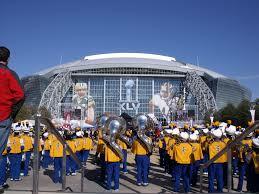 MOBILE, Ala. — Is the Super Bowl coming back to AT&T Stadium? That is one of the questions that has gone through the minds of North Texas denizens since Super Bowl XLV. When asked at the Senior Bowl if the Dallas Cowboys were trying to bring the big game back to Arlington, owner Jerry Jones gave a straight answer about the club’s efforts. Since North Texas hosted Super Bowl XLV, where the Green Bay Packers defeated the Pittsburgh Steelers 31-25, four of the six Super Bowls have been hosted in venues opened in since 2008. Only the Mercedes-Benz Superdome (Super Bowl XLVII) and State Farm Stadium (Super Bowl XLIX) were venues that had previously held a Super Bowl that ended up in the rotation. Another element that competes against the Cowboys’ efforts to host the NFL’s championship game is most of the new venues are in locales where winter weather is not a factor or they are indoors. Jones admits that playing in the NFL International Series “has varying degrees of consideration” on whether a city is awarded a Super Bowl. However, Jones won’t sacrifice any one of the Cowboys’ eight home games at AT&T Stadium in exchange for a Super Bowl. Aside from the fact North Texas is becoming the cradle of football excellence, especially at the high school level, there really is no other draw to having the Super Bowl at AT&T Stadium. Other than the 11,393 square-foot video board that hangs over the field, the newness, the facilities, and the retractable roof qualities of the stadium are ubiquitous among all stadiums. In fact, some venues have their own outstanding renditions. U.S. Bank Stadium in Minneapolis has the feel of an outdoor stadium, but the roof is completely encased in glass panels. Mercedes-Benz Stadium in Atlanta, the site for Super Bowl LIII, has an aperture for the retractable roof and a video ring around the bottom of the opening. When all of AT&T Stadium’s features are nullified, the drawbacks come to the fore. Two of the biggest problems, aside from the unexpected ice storm that hit Super Bowl week, were lack of entertainment around the stadium and no public transportation. The city of Arlington has its Milo service that operates during all major events at AT&T Stadium and Globe Life Park, the home of the Texas Rangers. However, the lack of restaurants, bars, and clubs around the stadium meant fans had to leave the area near the stadium to find such locations. The Rangers have experienced the same problem 81 times a year since 1994. Their solution has been to build up the space on Randol Mill Road between their new Globe Life Field, set to open in 2020, and AT&T Stadium with a mixed-use development concept called “Texas Live!” Jones likes what his fellow pro sports residents in Arlington have done with the concept, and believes it will help attract another Super Bowl. “I do, yes,” said Jones. “I think it creates a sports entertainment that frankly has no peer. I think it’s — I’m so excited. The aggregation of that type of adjunct activity around the games themselves is something that I believe in. I believe that you can enhance the experience with additional affinity type activity. The Cowboys won’t have a chance to hold a Super Bowl until 2025. The next five Super Bowls will be in Miami Gardens, Fla., Tampa, Fla., Inglewood, Calif., Glendale, Ariz., and New Orleans.